to write my novel amongst other things. So did I achieve my Write1Sub1, goal (to write one piece of fiction/poetry and submit one piece for publication) this month? AND I have made slow but vital progress on my WIP and I've decided to stick with the Working Title of Once Forgotten. Having read so often that to be a good writer you must read, read, read, I am still using some of my writing time to read lots and seems to be bearing fruit, which is great. So far this year I have had 3 things accepted. 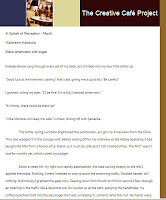 My 2012 Cafelit Flash Fiction calendar competition piece won the March slot, My Writer's News /Writing Mag Flash Fiction piece which fingers crossed will be published in the next issue July 2012 and my cat tale for Writer's for Animals, which should be out soon too. 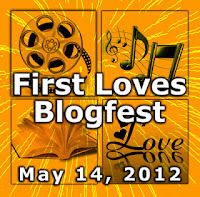 Don't forget that my Giving Voice Blogfest is rapidly approaching. A chance to flex those writing muscles. 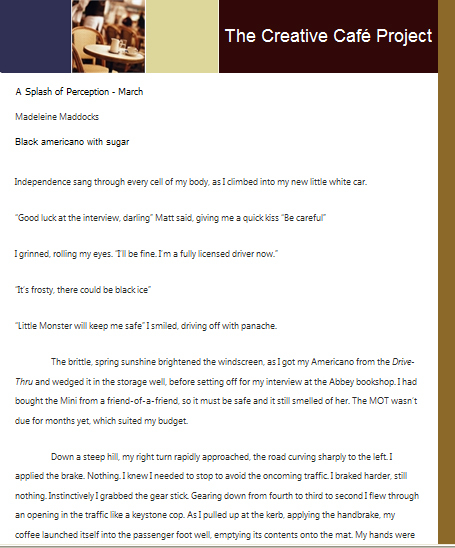 As writers we are encouraged to add detail to our description to make the scene come alive, so instead of a car we mention the car was blue, a Volkswagen Beetle, perhaps? 'When he returns he is carrying two plastic cups filled with strong coffee, mine black, his white'. Hmmm, now I'm thinking about a chunky mug. Maybe the coffee tastes better now, but what happened to the thin plastic cups? The characters in this novel visit many coffee shops, (don't get me wrong I love my coffee shots at Costa and Starbucks) and yet they seem to be largely drinking from takeaway disposable cups, since in yet another chapter they have Styrofoam cups, suggesting that (in this age of posh coffee houses competing for custom) these characters frequent some really tacky establishments! This kind of detail is surely important?Does it bother you? I know I have made similar screaming howlers in my writing, breaking out into a cold sweat when discovered, the chagrin creeping across my face until I have corrected the error and moved on. Just to let you know I've been working on my WIP again after many, many months of not even looking at it. 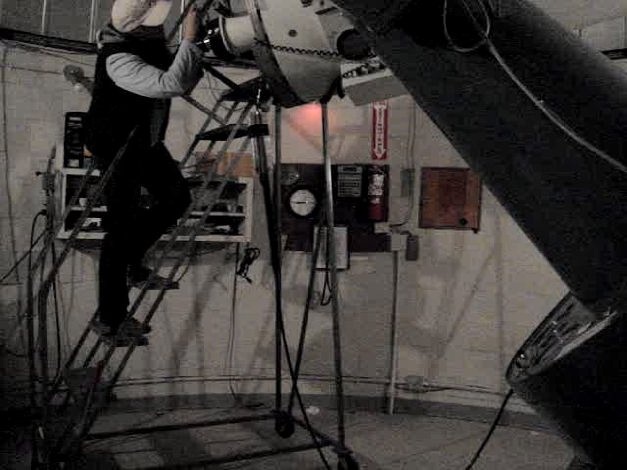 It is lovely to be back in the thick of it and I hope I can keep it up. So apologies if I'm still relatively quiet here in Blogland, though when I tried to catch up with all your comments yesterday, my Internet connection became suddenly poor, which was frustrating. Apologies to Rachna, as I've not produced any haiku lately. I did however, submit a poem to a competition last week; my first in absolutely ages. For those who don't know it is a chicklit/realistic fiction, suspence novel, laced with a little romance. 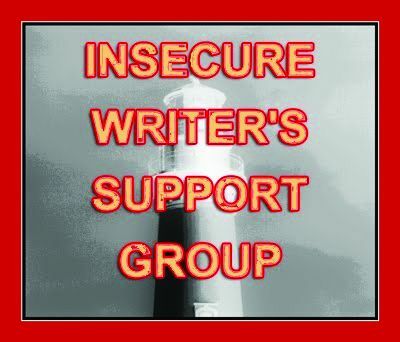 So what are your WIP novels about? Who could resist reminiscing with Alex J Cavanagh for this Blogfest? Okay so post your first loves – first movie, first song/band, first book, and first person. 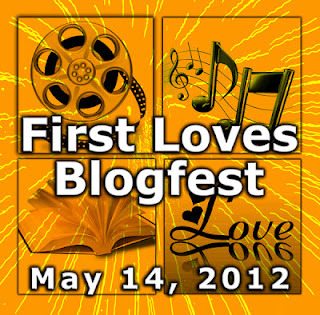 Four loves, one blogfest! 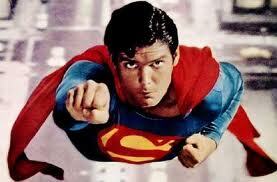 First Film: Remember I was a teenager in the 1970's and I feel head over heels for Superman. (Then I did again when the Dean Cain Terri Hatcher series came out decades later). I even swooned over the post in my bedroom every night. First Book: No surprises here as I have already blogged about this one. 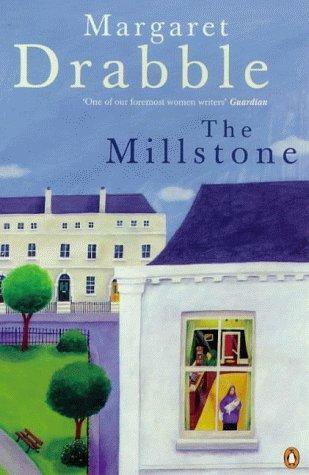 I read it at the age of 17 yrs and it was the first and only novel I read in 4 hours from cover to cover. First Song: I enjoy songs with lyrics I can join in with. 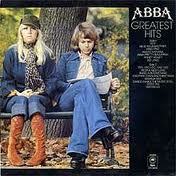 My first fav pop group/ album was definitely ABBA. However, like so many girls of my age, I also loved the Osmonds and one of my favourites was sung by the lovely Merril. 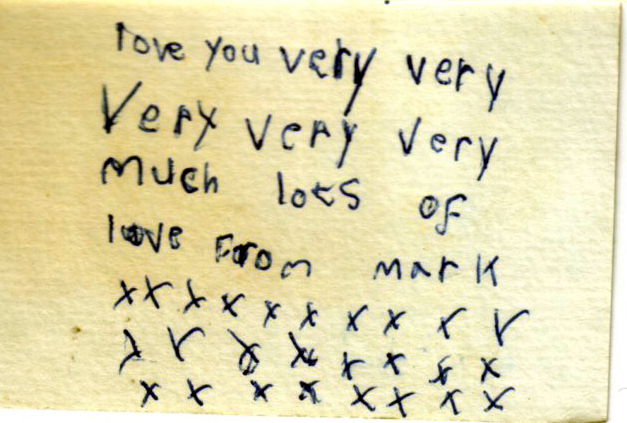 First Love: I was 5 yrs old and was being bullied in the playground by a group of girls and a little boy with red hair called Mark came to my aid and allowed me to join his friends at playtime. He was my hero and I will always love him for showing me such kindness. He gave me my first Valentine and made me feel special. What were your first loves? 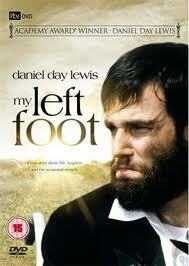 Ever wondered what it's like for someone who cannot express themselves? Maybe they have a stammer? Maybe their speech is slurred and it's an effort to control the muscles of their mouth to make the sounds clearly? Maybe they have a problem with the social side of talking? Are they someone who suddenly finds they can no longer speak as well as they used to through stroke or brain injury? or at all because of a Laryngectomy operation? Imagine the psychosocial impact of their speech impediment on their communication and interaction with family and others. The Giving Voice Blogfest is your chance to express what it means for those people in the form of a poem, excerpt, flash fiction piece. Maximum 400 words in length. How does your character feel about his situation? How will they cope with the speech problem? Maybe your story will include a Speech & Language Therapist transforming their lives (as the above examples of well known films of real life demonstrate). Sign up to the linky below and post your entry on the 4th June. You will be raising much needed awareness for those who are speech and language impaired. The more people who Blog about this Blogfest and post up their stories the better it will be. Thank you. 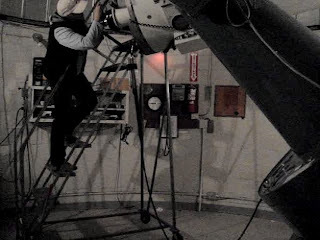 below, 'using the big telescope at the observatory' where she works. 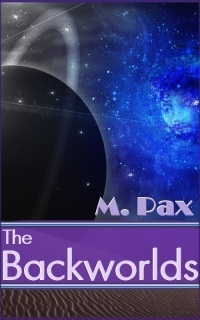 MPax is launching her SciFi novel Backworlds today. I was given a sneak preview of Chapter One. How will Craze rise up from under his father's thumb and how will he avoid losing the love of his life, when he'll be many miles away, doing his father's bidding? Good luck with the book launch MPax. The main purpose of RFW is to improve your writing by responding to prompts that receive friendly critique. Even if you're not much into romance writing I found it a great way to practice my flash fiction writing and tighten up my story structuring skills. Every second Friday there is a challenge posted in the left sidebar of the RFW site. You must post up to 400 words max of romantic prose or a poem on your own blog, then link it to the RFW website. Announcements will be made when there is to be a Featured Writer and a Runner Up. This will no longer happen for every challenge. You need to be a member to be awarded. These awards are chosen by Denise Covey and her co-host Donna Hole. There will be occasional guest posts, so check in. 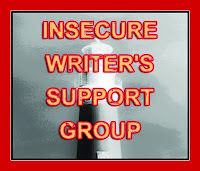 If you would like to write a guest post regarding romance or romantic writing, read the Guest Post Page then send Denise or Donna an email: den.covey@gmail.com or donnahole@gmail.com. Do you write flash fiction? She said "I think you'll like it"
I replied "Oh, okay, what's it like?" She stared pensively into the middle distance and then said "Odd!" However, I do wish we’d known the younger brother’s name at the end of the novel, as some kind of coming of age catharsis for him, perhaps? 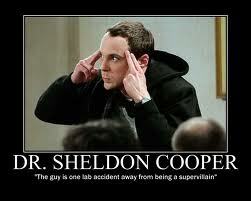 The thing that puzzled me, though, was the characterisation of the main character, Mal. While he seems to wants to change things he apparently just chooses to give up and risk his own health. David Whitehouse explains the reasons later in the novel (which would spoil it for others who have yet to read it if they were listed here and for the author who has carefully crafted it so that the reason is an eagerly anticipated denouement) but as an abiding disciple of behavioural psychology I couldn't quite reconcile why such a self-possessed and determined young man would decide to act in such a way. I personally needed to know much more about Mal to make the conclusions satisfy. 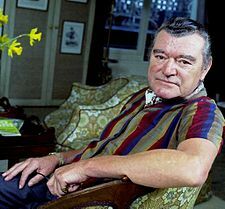 Nevertheless, I adored David Whitehouse's writing and his skillful portrayal of a man with morbid obesity; something that is becoming all too common in today's society. 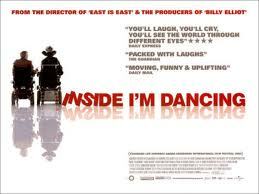 Guardian Synopsis 'As a boy, Malcolm Ede was charismatic and eccentric. He went out in the rain and took his clothes off in public. But on his 25th birthday he decides to take to his bed and stay there. Over the course of the next 20 years he swells, thanks to his devoted mother's near -constant feeding of him, to 100 stone – the fattest man in the world – and so traps himself and his family in a house that would need to be demolished in order to remove him. Mal's father lives in the attic, building mysterious inventions in an attempt to atone for a mistake in his past. His mother, reduced to a short-order cook and nursemaid, lives in a trailer in the garden. There too, sometimes, lives Mal's old girlfriend Lou who, unable to let go, sleeps in a tent and waits to answer his fan mail. All this is narrated by Mal's younger brother. For a lifetime he's been caught in Mal's charismatic, curly haired and rapidly widening shadow. He has tried to escape him but now, in his 40s and mysteriously injured with broken legs and a broken heart, he has returned home to sleep in the bed next to him'. 'While your descriptions are very vivid, you might try less of them in the same paragraph. 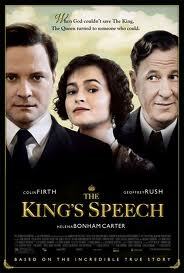 I like the magic ones to take centre stage without being outdone by the next one waiting in the wings. When the ordinary surrounds the magnificent, it stands out far more'. David Whitehouse & Lori Lansens and so, once again, I must believe in my own writing and myself.